Kelloggs is a smart bunch of people. They sold us Frosties for years before everyone got tired of paying double for cornflakes just because they’d already put the sugar on for you. They’re usually exploiting public stupidity, not contributing to it. However, the current gimmick helping to sell our batch of CocoPops couldn’t have even seemed clever when the CEO’s kid scrawled it on the back of his maths homework. Why daddy went through with it is anyone’s guess. “But sir…” says a concerned employee, perhaps the Manager of Nominal Vitamin Enrichment. Ah! you might say. But what about that clever little U-bend in the spoon shaft? Surely that lets you get that straw nice and low if you go in sideways. 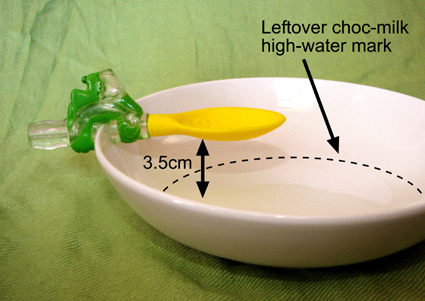 I may have the technique wrong, but the spoon actually seems to bend away from the bottom of the bowl. 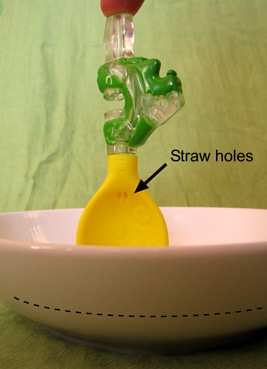 I think that ungenious little kink in the shaft of the straw-spoon is actually a milk-collecting reservoir for all those times at the breakfast table when you feel like the rancid, flaky memories of breakfasts past to wander out of the straw and onto your spoon. On the other hand, because of its careful design, it’s highly unlikely that you will ever have got milk in that unwashable catchment area in the first place. 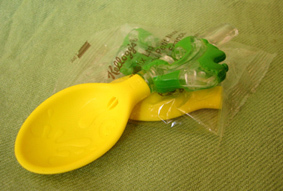 I’m afraid that when it comes to ingenuity, this strange offering earns Kelloggs the wooden spoon.